An industrial or commercial kitchen can allow residents the opportunity to build economic self-sufficiency. In some communities, making and selling traditional foods is an important part of women’s cash economy. 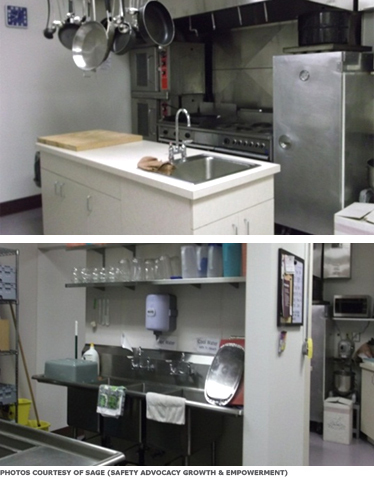 Some programs (like those situated in YWCA’s for example) have access to a large industrial or commercial kitchen that isn’t used for day-to-day cooking. These can increase economic options for residents (and non-resident program participants) if they are made available for culinary classes, or preparing food for catering or markets. Refer to health code requirements for local regulations regarding commercial kitchen design where food for public consumption is prepared. Gardens incorporated on shelter sites enable residents to grow their own food. At SAGE (Safety, Advocacy, Growth,& Empowerment), the domestic violence program in Wenatchee, WA, a garden is the heart of a project that creates a circle of care, community and empowerment for Latina women experiencing domestic violence. SAGE convenes La Charla (“the conversation”); the group nurtures a garden where they learn to grow produce; the produce, combined with resources from the local food bank, gets transformed into a weekly family meal that takes place before support groups for Latina women and their children; cooking and eating the meal take place in a local church’s commercial kitchen. This web of cooperation has created a powerful self-empowerment model; participants are writing a cookbook, deciding what they want to learn and bringing in people to teach it to them, nurturing their children, and beginning to reach out to other women in need. The garden serves as a source of peace and refuge, a metaphor for building relationships and community, and a food source. By gardening, cooking, eating and learning together, women in this group have created strong mutual support systems, increased their skills, nurtured their children and opened new worlds.